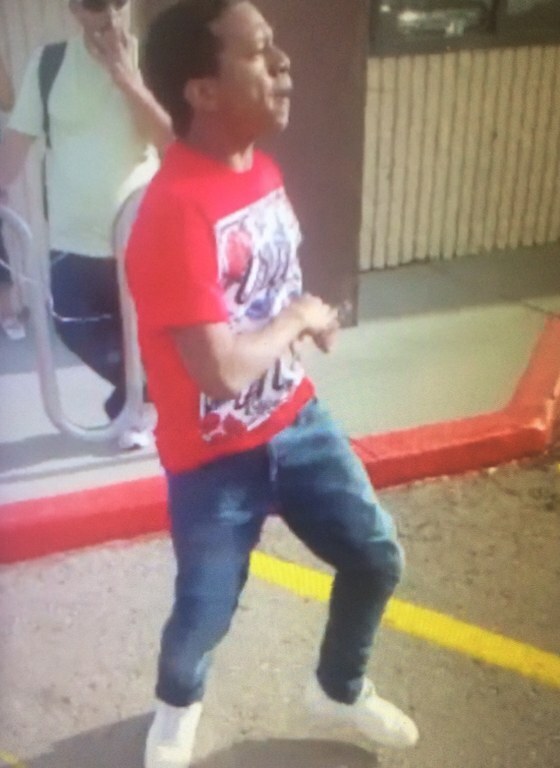 ALBUQUERQUE, N.M. – The Albuquerque Police Department is asking for the public’s assistance in identifying a man who assaulted an Albertsons employee. Just before 6 p.m. on Monday, April 17th, dispatch received a 911 call that the suspect was armed with a machete, refusing to leave and threatening employees at the Albertsons on the 2800 block of Eubank NE. Employees reported that the customer was under age and refusing to leave the liquor section of the store. They also said he was causing a disturbance and making verbal threats to the employees. Surveillance video shows the man yelling at an employee and a security guard. It also shows him pull what was described to dispatchers as a machete, out of his backpack before leaving the store. While employees are watching the man leave, he suddenly turns around, charges at the Albertsons employee and punches him in the face. The employee has a few loose teeth, and was checked out by rescue on scene. The original responding officer was Officer Johnathan McDonnell who was involved in a serious accident on his way to the call. When officers arrived at Albertsons, they were unable to locate the suspect. They are looking for a man who is described as African American, about 18 years old, 5’6”, with a medium build. He was wearing a red shirt, jeans and carrying a gray and black backpack. If you have any information concerning this individual you’re asked to call Crime Stoppers at (505) 843-STOP. The suspect will be charged with Aggravated Assault. This is surveillance video from inside the Albertsons.